The flagship Readings Carlton shop was established in 1969 and has since been joined by stores in Hawthorn, Malvern and St Kilda, as well as a boutique shop in Palmer Hall at the State Library of Victoria, and – most recently – a shop in Westfield Doncaster. The original shop at 366 Lygon Street was founded by Ross Reading, his partner Dot and Peter Reid. The store was partly funded out of Dot’s teaching wage and, interestingly, after a particularly busy day, the shelves were known to have occasionally been restocked from Ross and Dot’s own private bookshelves at home. Mark Rubbo was the owner of Lygon Street’s Professor Longhairs’ Music Shop when he bought the business in 1976, along with partners Greg Young and Steve Smith (who owned the South Yarra Record Collector and ran a mail-order music business respectively). In 1983, the shop moved to larger premises on Lygon Street and, throughout the 80s and 90s, business boomed, leading to a final move in 1998 to the former Commonwealth Bank building across the road. Mark is today recognised as one of the book trade’s leading authorities, and was awarded a Medal of the Order of Australia (OAM) for service to the community through fostering an awareness of Australian literature as a bookseller. Readings was awarded the Bookstore of the Year Award at the 2016 London Book Fair International Excellence Awards, and the Independent Book Retailer of the Year at both the 2016 and 2017 Australian Book Industry Awards. Today, Readings boasts stores at six locations across Melbourne, each with its own individual character and strong ties to the local community, and each with its own carefully curated range of books, music and film. Readings Carlton has long been an iconic gathering place for writers, publishers, artists and intellectuals, including cartoonist Michael Leunig, writers Helen Garner, Benjamin Law, Monica Dux, Jeff Sparrow and Catherine Deveny as, as well as a veritable ‘who’s who’ of local novelists. 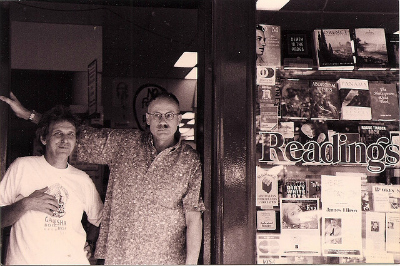 Carlton was awarded Independent Bookseller of the Year at the 1998, 2001, 2009 and 2010 Australian Book Industry Awards, and Australian Chain Bookseller of the Year 2006. Our St Kilda shop on Acland Street also has iconic origins (it was formerly the independent bookshop Cosmos), as well as its own famous clientele, such as musicians Paul Kelly and Nick Cave. St Kilda also keeps a rare and impressive range of books from independent publishers, featuring titles from Melville House, Dalkey Archive, New Directions, Twisted Spoon Press, Exact Change Publishing and the New York Review of Books, among many others. Readings Hawthorn has been a major Melbourne author events destination since it moved from across the road to a larger space. Readings Malvern moved to its current site on Glenferrie Rd over ten years ago. Its loyal customer base is mostly drawn from the local community, with many regular customers shopping there for years. Readings at the State Library of Victoria is the first permanent commercial bookshop permitted to be established in the building in the Library’s 150 year history. Readings won the tender to run the shop in April 2009, and set out to create a unique space that caters to students, travellers and library-regulars. Readings Doncaster opened at the end of September 2016, and is the first Readings shop to be located in a major shopping centre. Our first ever speciality children’s and young adult bookshop also opened in 2016. Readings Kids is home to books, music, games and more for kids and teens, and welcomes families and people of all ages who enjoy children’s and young adult literature.